A beautiful day in Tbilisi. 26 degrees and sunny. 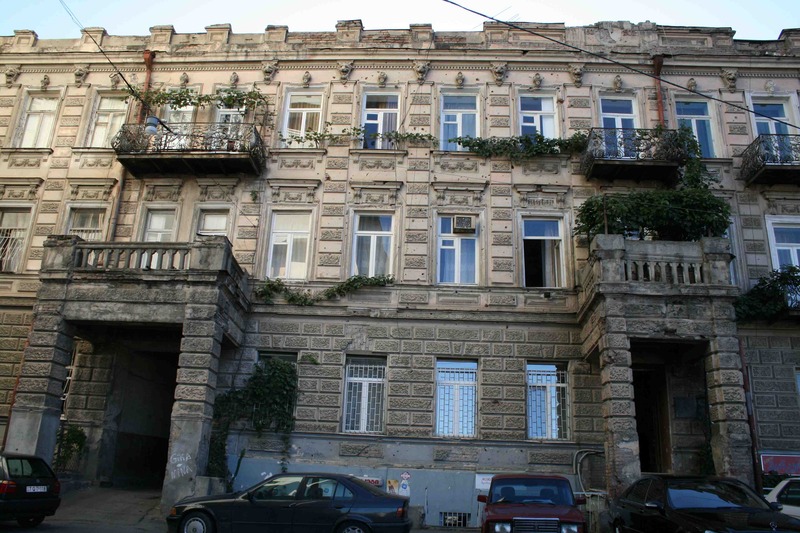 A brief update: went to a ‘researcher’s lunch’ yesterday, comprised mostly of former academics now pursuing projects related to the Caucasus region, based here in Tbilisi. Met some interesting people and got access to the International School of Econimics’ library; a handful of books that might be of interest (they’re mostly on economics and regional politics, naturally), as well as access to JSTOR, which will be useful. Found a Mac store, which may also be useful in the future. Walked along leafy Barnovi Street in fashionable Vera for a while, checking out the shops and cafes. On several of the shop windows, and pasted on the rear window of a number of cars, I saw a sticker saying “WE ARE GEORGIA: Four Centuries of Resistance”, emblazoned on a target-shaped circle. I’ll have to get a picture of it. 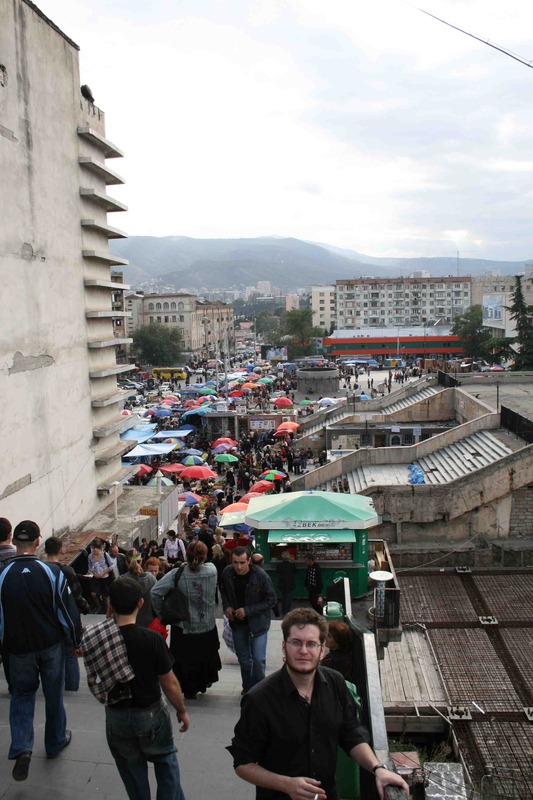 Went to the market near Vagzlis Moedani again the other day, this time with Ben (the chap in black at the bottom of the picture). It’s an amazing place–huge, with every conceivable kind of product: fruit, vegetables, meat, fish, clothes, kitchen utensils, hair products, knick-knacks of every kind. We were looking for chacha (local booze, made more or less in the same way as grappa), and were told there was an area with chacha dealers down by the bus station. (Ben speaks Russian, which is extremely useful). So we meandered through the markets, checking out the wares, occasionally tasting the odd mysterious-looking tidbit. Ben got a fold of what he called fruit leather, made from some kind of berry; it reminded me of what I think were called “fruit roll-ups” I used to have in the US, but obviously made from natural ingredients. Quite delicious. 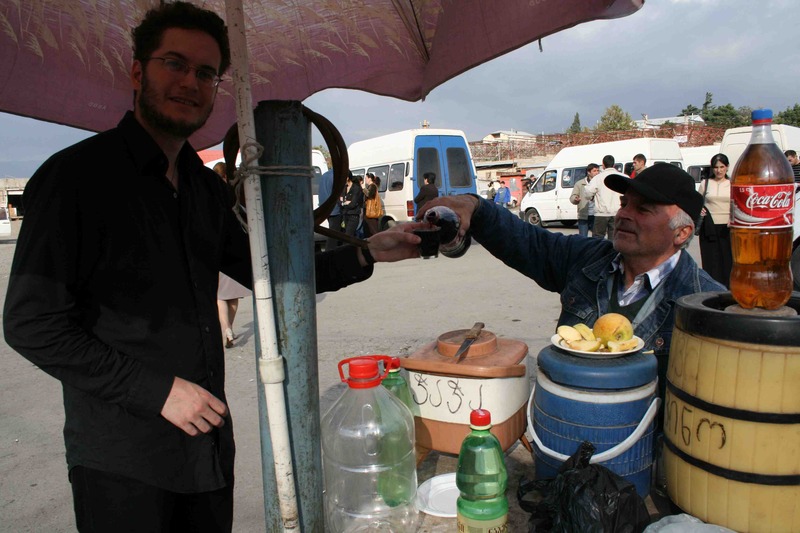 I also tried kvas, a refreshing, slightly fermented drink made with bread. Eventually we found the bus station, though there was only a single solitary chacha vendor, sitting on a rickety stool near a makeshift stall with a number of casks on it. Ben chatted to him a bit, and we tried the two kinds of chacha he had there, one milder kind, about 48% proof (he said), and another, more potent variety that could be used to power one’s Lada. We settled on the lighter one, and got a liter each. After he’d filled the two bottles from his chacha cask, he looked into it, grumbling, and dipped in a finger, trying to fish out a bug or two that was floating near the top. He shrugged and screwed the cap on. We mentioned that tequilla is bottled with a worm at the bottom, and he seemed to like the notion. We talked for a little while (Ben talking, rather, and translating for me), trying the glasses of red and white wine he offered us. 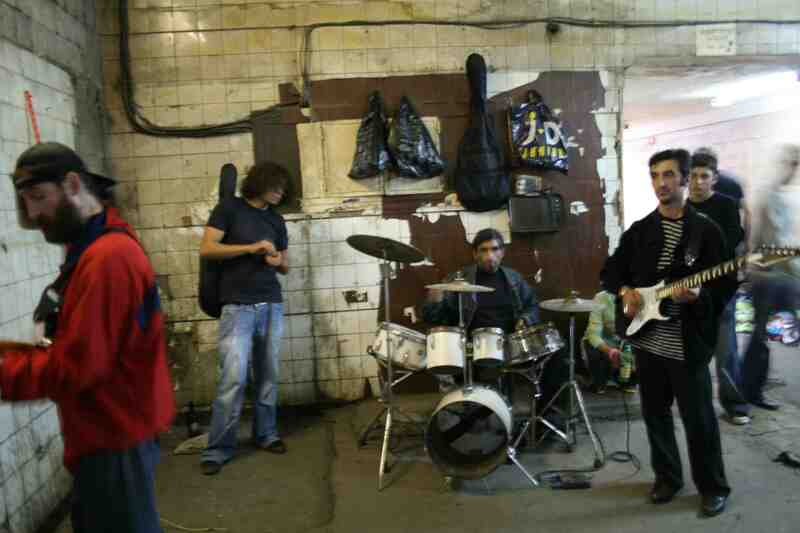 There also seems to be a culture of bands playing in the subways; this band was, I think, at the Marjanashvili stop. Someone was telling me that most of the local musicians start out busking, and graduate to bars and clubs. Not bad, actually. Behind the parliament there’s a block of buildings, quite elegant, still pock-marked with bullet holes—not, I’m told, from the April 9th massacre of Georgians in front of the parliament (there’s a plaque near the parliament commemorating that event) by Soviet troops, but from the later ‘civil war’. I put that in quotes because, from what I can gather, it was less a civil war than bandits and militias simply fighting amongst themselves. They took up stations on either side of Rustaveli, the main thoroughfare in downtown Tbilisi, and shot at each other. One guy was telling me that in the pauses inbetween the fighting, the soldiers would go down to the zoo and shoot the animals. Crazy. Like father, like son. 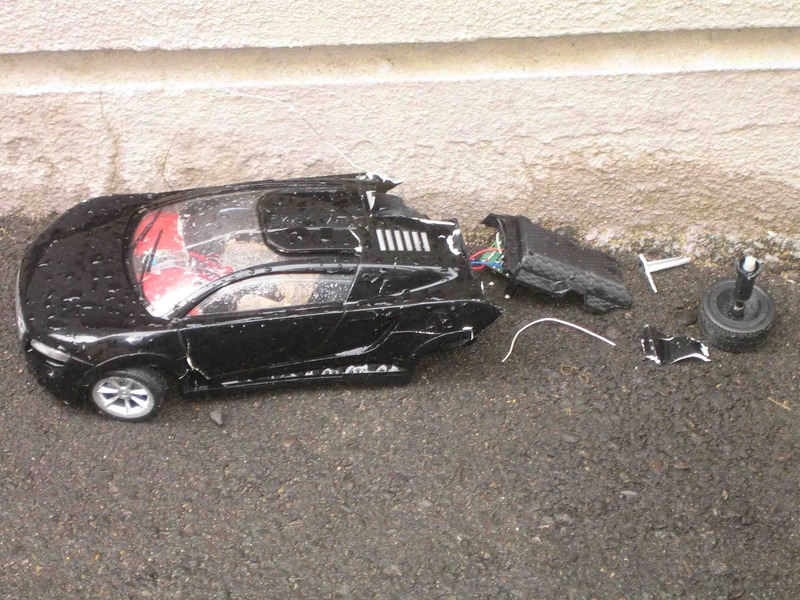 I was amused to find this broken and neglected remote-controlled car lying forlornly by the curb of the road, in emulation, it seemed, of the slowly decomposing corpses of battered old Ladas one sees occasionally. It looked like it was partially run over (which wouldn’t surprise me), and then simply left to decay, to be sniffed at by stray dogs and eventually crushed to plastic crumbs by passing vehicles. Also met Lali (Zakaria Paliashvili’s daughter-in-law) again this afternoon, who took me to meet Nana, a woman of great accomplishment and equally prodigious girth. She works now at the university, a professor of linguistics, conflict management/prevention, and gender studies (if I understood correctly); has taught in England, Italy, and the US; and was for a time a member of the parliament. She also gives Georgian lessons—which was the primary reason for my going there—and though it would be quite expensive, she’s certainly interesting and full of amusing anecdotes. She told me how, when the first US ambassador came to Tbilisi in ’92 or ’93, he desired to take Georgian lessons with her. She accepted, requesting a modest sum; the embassy arrogantly replied that they’d pay her no more than a dollar per hour-and-a-half lesson. Piqued, she said “I will teach your ambassador for free, given that you officially recognize this service as humanitarian aid from Georgia to the United States.” Apparently they were willing to offer her a fairer deal afterwards.